Headlines: The fishing over the past week was very good though the weekend was a little tougher with the wind. Lake Eucumbene still produced some great rainbows despite the weather. All methods have produced and the quality of fish coming in continues to be excellent. 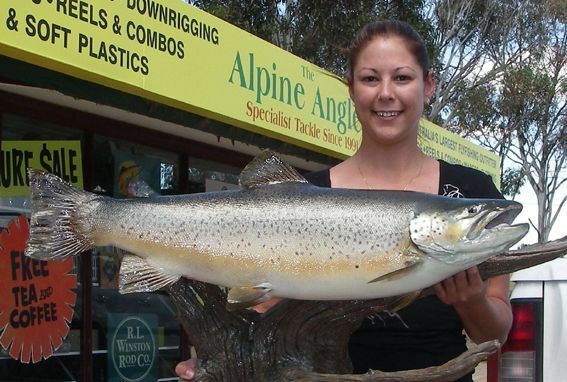 You may recall the huge brown caught a couple of months ago by Tracey Blundell. Here is a photo of the finished taixdermy job performed by John Ruiz at Skins Alive. Great looking fish and a truly life long trophy. Rivers:- Despite some rain has helped a few of the high country streams. With the Murrumbidgee and Eucumbene catchments getting a bit. The fishing during the daytime will be good with small dry flies like hoppers and stimulators worth a try and emerger stly patterns during the evening. As the temperatures get progressivly colder hatches will occur in the warmest part of the day and this can be grea for dry fly angling. Lake Eucumbene:- The lake had huge mudeye hatches early last week but they did taper off when the wind and rain hit inthe later part of the week. Fish were still coming in on the weekend and some cracking rainbows amongst them. The lower end Crowe's round through to Seven Gates have been very good areas, but Old Adaminaby and Anglers Reach have been producing some reasonable numbers. Fish have been onto them most of the time and there are some great quality fish to be found. There have been a few, not many but a few rainbows pushing 2kg. Most of the fish are averaging 800gm - 1kg and are in excellent condition. Any of the standard streamers will work at present. Evening fishing with Muddlers and Mudeye patterns are generally the best. Beadhead nymphs have been a good searching pattern in deeper water during the day. *Edmond and Fiona came up for a night session on Sunday night, with Fiona catching three great fish in as many casts. *The Doherty and Lees team who were in last weeks reports had a good last day and caught twelve fish mostly on Fuzzy Wuzzys. Fish were up to 1.02kg. *Clint from Sydney had a few blinder sessions last week landing thirty fish on Taihape Ticklers. All fish were in superb condition. *Leo Harding from Wollongong had two ripper sessions at Buckenderra hooking twenty eight in two nights. *Mick and Ivan from Sydney trolled Buckenderra for thirty fish on five colours of leadcore with biggest being a 2.5kg brown. Tassie # 11 was the best colour. They got smashed up by an even bigger brown at the boat. When the storms started coming through the fish went off the bite. 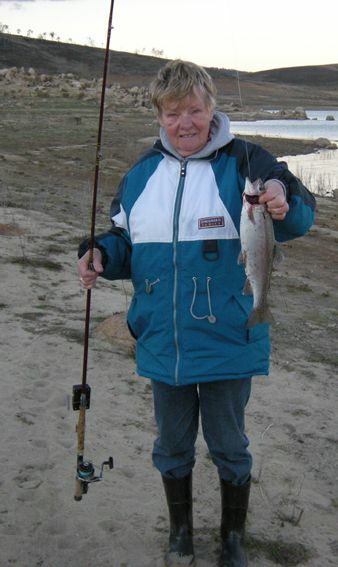 *Mick and Ivan mentioned just above also caught ten at Jindabyne before heading to Eucumbene. *Tina Gerhardt from Austria caught this nice rainbow and one other recently, at Seven Gates, on a spider mudeyes. Great way to spend a holiday.